Things that you discover yourself are very pleasant. Usually, they are known and routine for others but there is a pleasure in solving a problem. When I came to the go club, there was a tournament for the novices. 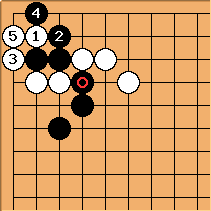 In one of the games the following position was looming. 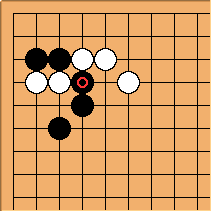 Both white and black stones have 3 liberties, and with White starting White has to win the semeai. So it seemed to me, but I as I was trying to read it out I could not kill faster than the opponent. I spent quite a long time pondering on this position but could not find the solution for White. Yet, there was a feeling that White had to capture faster. The position was never realized in the game. Either my opponent knew the correct answer or was just a novice and dismissed it without reading: he did not cut with . I won the game, yet I would have lost if the position had occurred. I came home, put the position on the goban and started to think hard. Of course, 'everybody' knows the tesuji (belly attachment), but I found the move myself. I was so proud. Velobici: Congratulations! Finding it yourself will help you remember it always. The belly attachment works for both sides here. Whichever side plays it first wins. It is a tesuji that is frequently seen (or implied) in joseki.